Here are the Dogs of the Dow for 2018. The table lists the ten highest yielding Dow stocks as of the close on December 31, 2017. These ten stocks are 2018’s Dogs of the Dow. 2018’s Small Dogs of the Dow are the five stocks with the lowest closing price are, so a subset of the Dogs of the Dow. 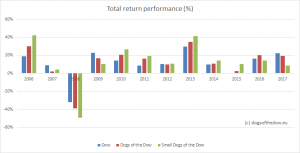 The performance over 2017 has been 19.4% for the 10 Dogs of the Dow, versus 22.50% for the Dow Index and 8.7% for the small dogs.